Sorry for going on a stripes craze in my past 3 pairings! ^_^ I did not notice until last night when I was preparing this post, but as you read this I am in Reno, NV for the Labor Day weekend. My family and I are here to attend the annual Rib Cook-Off! I'll try to share photos via my Instagram: @connnietang! I was hoping to post some Fall pairings on my blog next week, but it looks like that will have to wait because the weather is 90+ degrees here. >_< I am going to melt!!! So look out for a bunch of summer weather inspired pairings next week! I hope everyone has a nice and eventful long weekend! Also look out for a new giveaway starting Monday, Sept 2nd! 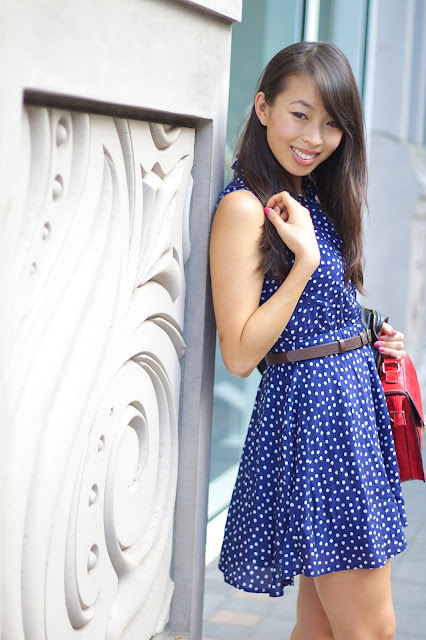 Steal: A-Line Polka Dot Dress from Forever 21, here. Splurge: Brand of Gypsies Woven Babydoll Dress from Nordstrom, here. Steal: Bead Chain Braided Belt from Forever 21, here. Splurge: Avery Versatile Waist Belt with Metal Tip from Linea Pelle, here. Necklace: Autograph Plate thanks to TAudrey, here. 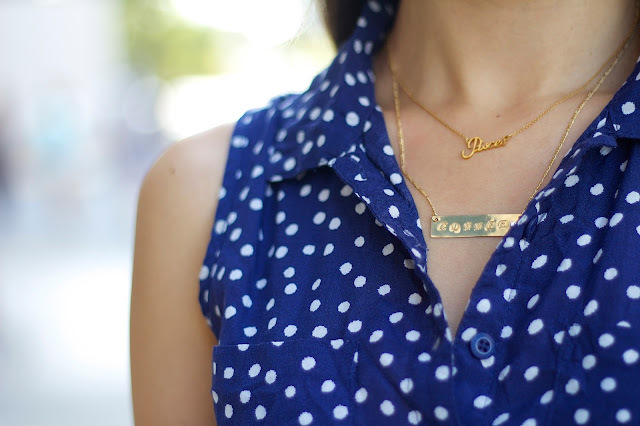 Rebecca Minkoff Pisces Zodiac Necklace thanks to Trend Boutique, here. Steal: I Love You Pendant Necklace from DailyLook, here. Amore Chain Necklace from Forever 21, here. Splurge: Autograph Plate from TAudrey, here. Rebecca Minkoff Pisces Zodiac Necklace from Trend Boutique, here. Bag: Ladylike Bow Satchel thanks to DailyLook, here. Steal: Ladylike Bow Satchel from DailyLook, here. Splurge: Hayden Satchel by GiGi New York, here. Steal: Heel Less Wedges from DailyLook, here. Splurge: Zenn Wedge by Steve Madden, here. I cannot believe that it is almost September, this year has flown by so quickly. I started this blog on my birthday this year and it has been an amazing and personally challenging journey. To my readers & friends, wanted to thank you for being supportive and believing in me, I would not be able to do this without you. From the bottom of my heart, thank you so much. Dress: Striped Fit and Flare Dress from Banana Republic, here. Steal: Supreme Striped Dress from DailyLook, here. 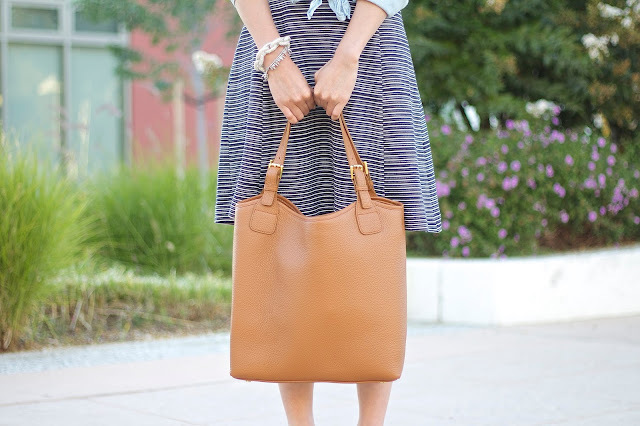 Splurge: Striped Fit and Flare Dress from Banana Republic, here. Top: Mimi Chica Chambray Top from Tillys, here. Steal: Mimi Chica Chambray Top from Tillys, here. 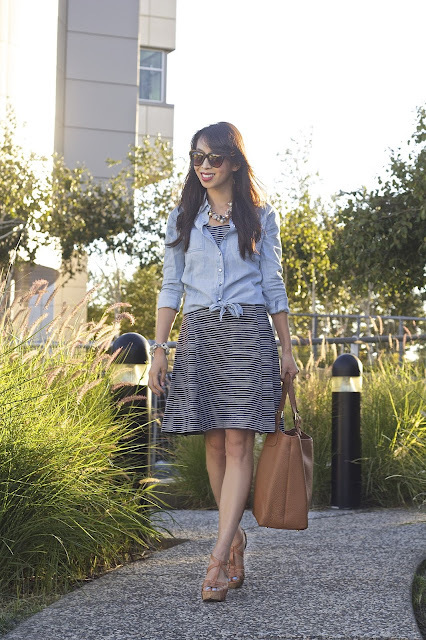 Splurge: Chambray Shirt from Forever 21, here. Steal: Shopper Bag from ZARA TRF, here. Necklace: Laela Necklace thanks to Lotus Blossom Designs, here. Steal: Laela Necklace from Lotus Blossom Designs, here. 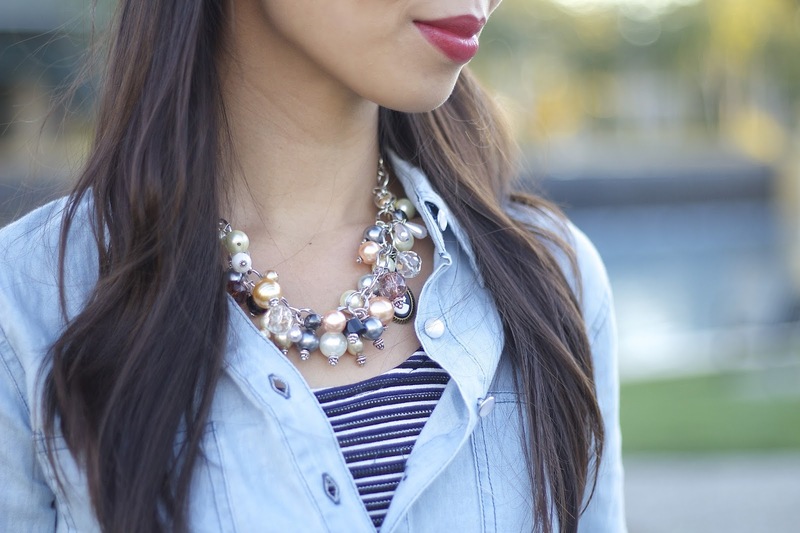 Splurge: Nina 'Melaney' Ribbon & Cluster Bib Necklace from Nordstrom, here. Bracelets: Kelsi Bracelet in Silver thanks to Glamour Me Jewels, here. Silver Spike & Pave Beaded Bracelet from Stella & Dot, here. Steal: Chic Chain Bracelet from DailyLook, here. Silver Petite Spike Bracelet from YuniKelley, here. Splurge: Kelsi Bracelet in Silver from Glamour Me Jewels, here. Silver Spike & Pave Beaded Bracelet from Stella & Dot, here. Sunglasses: Oversize Designer Inspired Womens Fashion Sunglasses 8445 thanks to zeroUV, here. Steal: Oversize Designer Inspired Womens Fashion Sunglasses 8445 from zeroUV, here. Splurge: Karen Walker The Number One Sunglasses from Shopbop, here. Splurge: Geri Wedge Sandals from Sole Society, here. 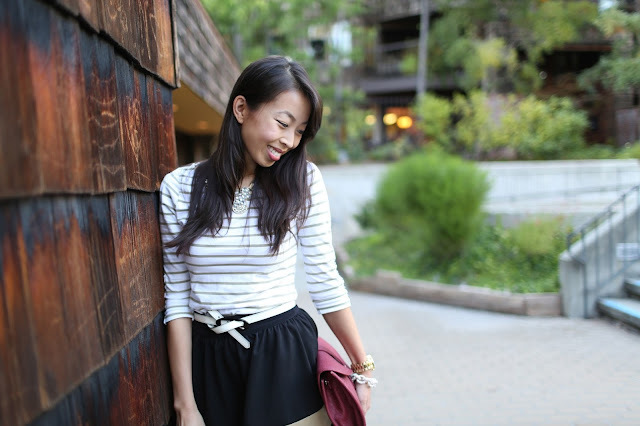 I wore this pairing to a birthday dinner with my girl friends and it is so simple to put together! 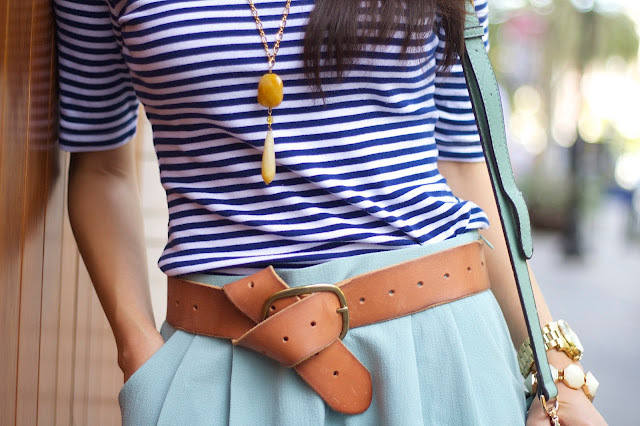 A top, an a-line skirt, and a belt tied at the waist! I added a few statement jewelry to glam up the look, but kept it very comfortable. 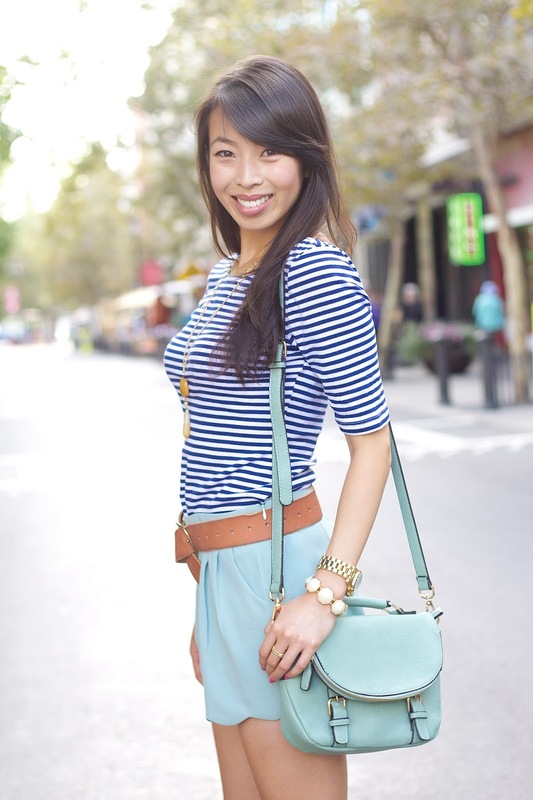 Steal: Boat Neck Striped Top from Forever 21, here. Splurge: Embellished Striped Tee from Banana Republic, here. Steal: Cool Girl Mesh Skater Skirt from Forever 21, here. 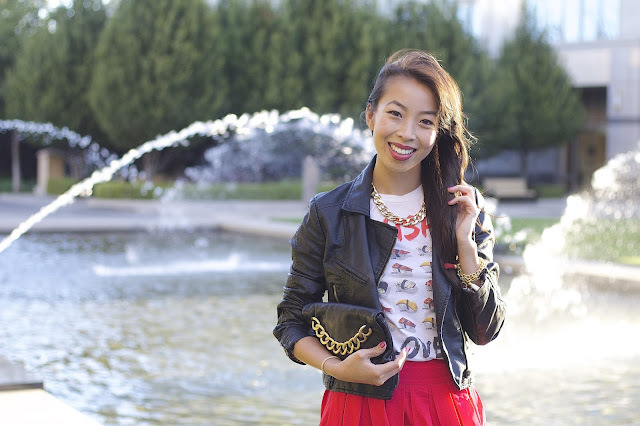 Splurge: Faux Leather Skirt from American Eagle Outfitters, here. Steal: Textured Reversible Belt from Banana Republic, here. Splurge: Allegra Double Wrap Skinny Hip Belt by Linea Pelle, here. Steal: Chunky Crystal Bauble Statement Necklace from Kristin Perry, here. Bracelet: Rose Gold Pave Beauty thanks to Derng, here. Splurge: Rose Gold Pave Beauty from Derng, here. Steal: Geo Ring and Ball Bead Ring Set from Forever 21. Textured Midi Ring Set from DailyLook, here. Splurge: Heart Ring from Madi & Bee Co., here. 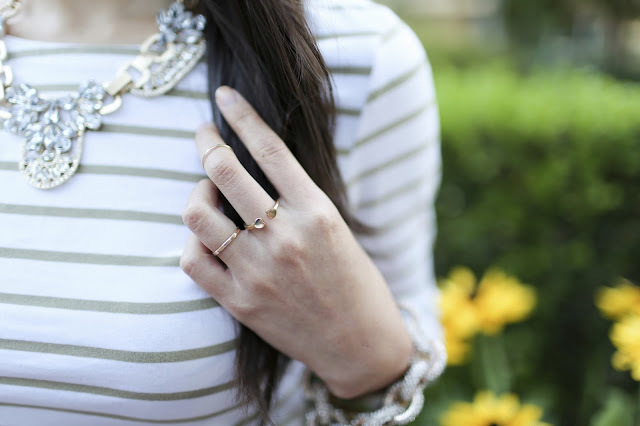 Two Gold Stacking Rings from Thought Blossoms, here. Hancock Park Adjustable Cocktail Ring by Kate Spade New York, here. Bag: Maroon Clutch from the streets of Hong Kong. 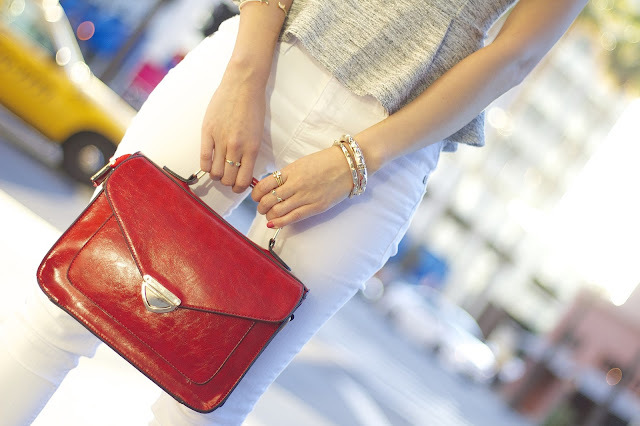 Steal: Classic Faux Leather Crossbody from Forever 21, here. Splurge: Aavery Pump by Betsey Johnson, here. 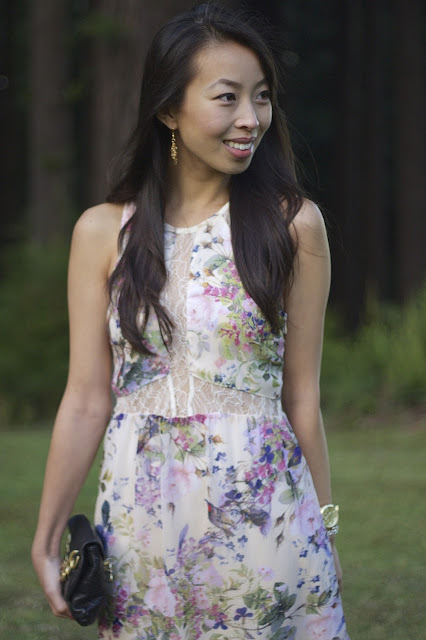 I wore this pairing to an outdoor wedding this past weekend and the dress is so light and pretty. I really liked the back lace, but it was hard to wear undergarments. I ended up wearing gel petals to keep the back bare. As you read this, I am camping in Yosemite and trying my best to not get bug bites! I am prone to getting bug bites, so wish me luck! I would like to congratulate Kamola for winning my YuniKelley giveaway! Steal: Wild Rose Print High-Low Dress from Forever 21, here. Splurge: ASTR Lace Illusion High/Low Dress from Nordstrom, here. Steal: 18k Gold & Crystal Bangle thanks to YuniKelley, here. Splurge: Tasha Beaded Stretch Bracelet from Nordstrom, here. Earrings: Stunning Tear Dop Earrings thanks to Lotus Blossom Designs, here. Steal: Stunning Tear Dop Earrings from Lotus Blossom Designs, here. Splurge: Crystal Copy Crystal Drop Earrings from Nordstrom, here. Steal: Sleek Envelope Crossbody from Forever 21, here. Splurge: Grayson Bar Bag by Linea Pelle, here. Steal: Crisscross Faux Suede Platforms from Forever 21, here. Splurge: Crossover Pumps from Sole Society, here. As I always say in my bio, I am a sushi lover. 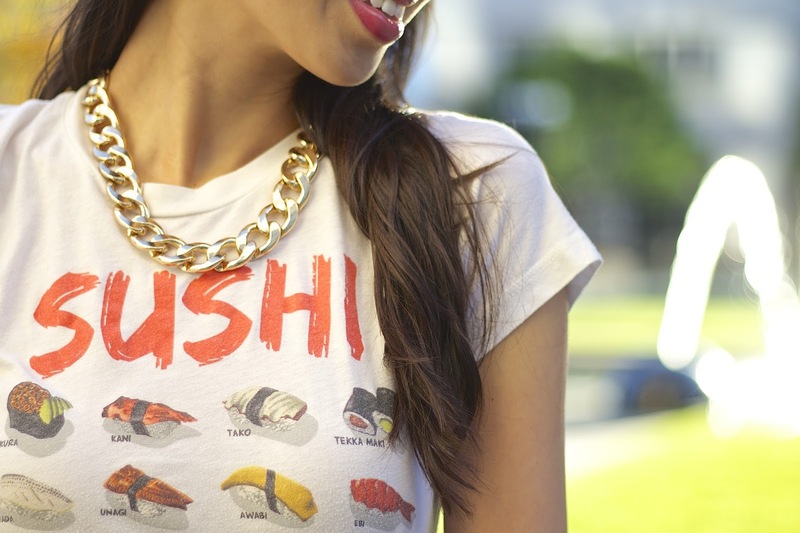 So much that I will wear sushi clothing! 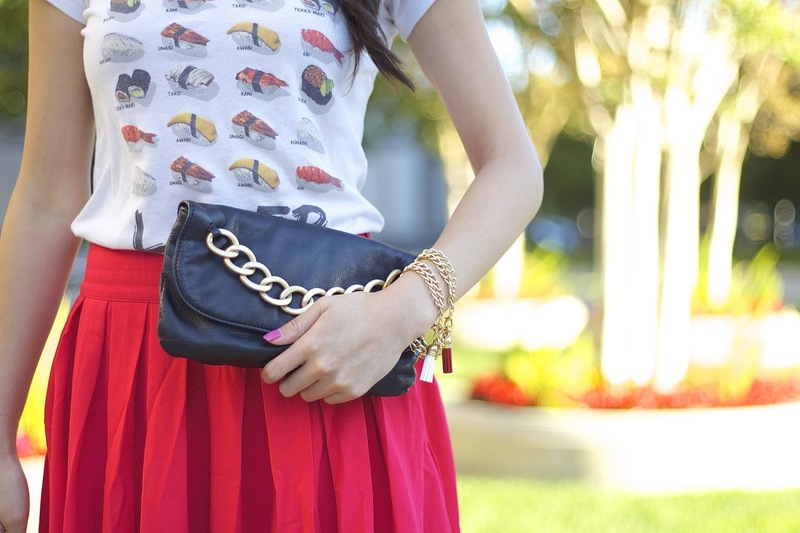 :P I got this graphic top many years ago from Forever 21 and it is one of the oldest and most worn items in my closet! Although the macaroon top, worn here, is a close contender. Which one do you like more? Jacket: Cool Nights Moto Jacket thanks to DailyLook, here. Steal: Cool Faux Leather Jacket from Forever 21, here. Splurge: Classic Motorcycle Jacket from DailyLook, here. Steal: Kawaii Sushi Maki Nigiri tshirt by MilkshopKawaiiShop on Etsy, here. Splurge: Sushi Friends T Shirts from Zazzle.com, here. 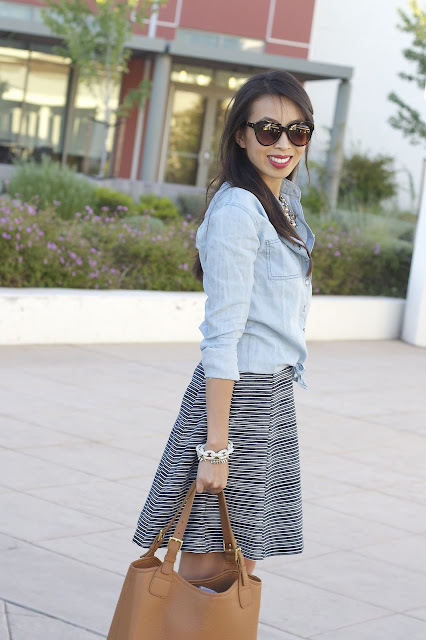 Steal: Bright Pleated Circle Skirt from DailyLook, here. Splurge: Devlin Pleated Skirt from Nordstrom, here. 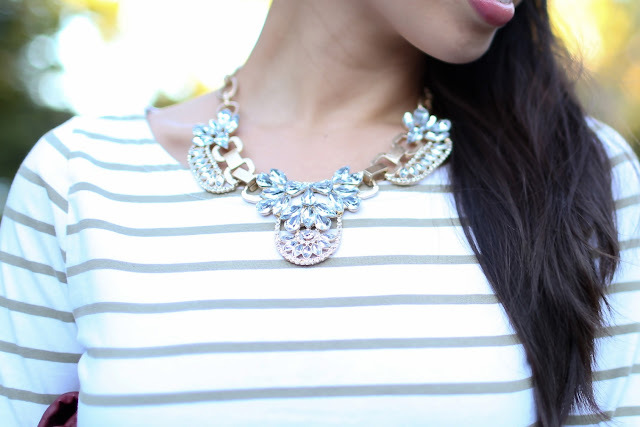 Steal: Elegant Chain-Link Necklace from Forever 21, here. Bracelets: Tassel Bracelets in red and white thanks to Cathryn Ann, here. Steal: Tasha Beaded Stretch Bracelets from Nordstrom, here. Splurge: Tassel Bracelets in red and white from Cathryn Ann, here. Splurge: Suede Strappy Sandals from ZARA, here. 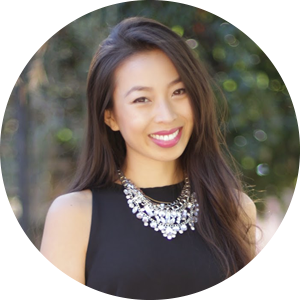 Steal: Static Peplum Tank from Forever 21, here. Splurge: Embellished Peplum Top from Topshop, here. Steal: White Jeggings from American Eagle Outfitters, here. Splurge: Jolt Skinny Jeans from Nordstrom, here. Sunglasses: High Pointed Tip Insert Frame Oversize Cat Eye Sunglasses thanks to zeroUV, here. Steal: High Pointed Tip Insert Frame Oversize Cat Eye Sunglasses from zeroUV, here. Splurge: Prada Cat's Eye Sunglasses from Nordstrom, here. Necklace: Fringe Necklace thanks to Brighthouse Baubles, here. Steal: Fringe Necklace from Brighthouse Baubles, here. Splurge: Tildon Vintage Necklace from Nordstrom, here. Bracelets: Half Moon Cuff thanks to Madi & Bee Co., here. Elaina and Suzie bangles thanks to Sequin. Steal: Half Moon Cuff from Madi & Bee Co., here. Clear Cut Stripe Cuff and Geo Cutout Bracelet from Forever 21. Splurge: XO Cuff from Gorjana Griffin, here. Elaina and Suzie bangles from Sequin. Rings: Heart Ring and Triangle Ring thanks to Madi & Bee Co. Steal: Heart Ring and Triangle Ring from Madi & Bee Co.
Splurge: Arrow Wrap Ring from Gorjana Griffin, here. Steal: Ladylike Bow Satchel thanks to DailyLook, here. Splurge: Quilted Messenger Bag from ZARA, here. Steal: BELLA from ShoeDazzle, here. Splurge: Ankle Strap Stilettos from DailyLook, here. Nails: Casanova Is So Into Me Polish from Sephora by OPI, here.